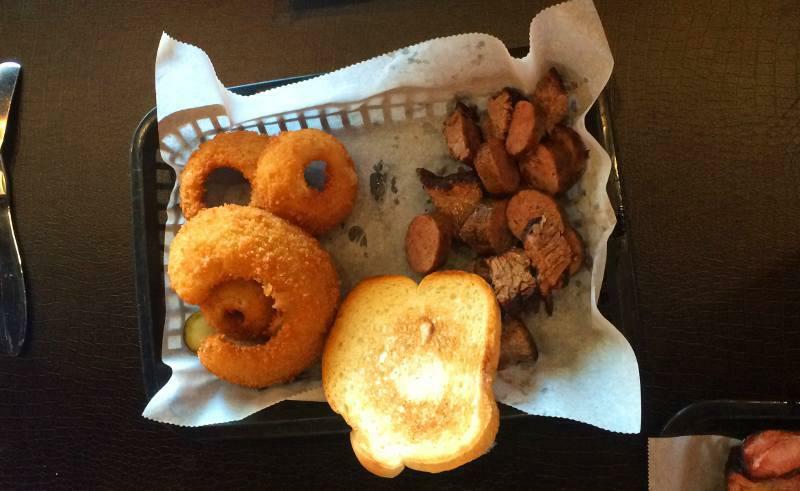 Friday - October 3, 2014: For lunch, I tried out the new Fireside BBQ in Overland Park. It is open only 11-1:30 & 5-7:30 Monday - Friday. The food should have been warmer, but I enjoyed the food overall. The rib tips were outstanding and the cheesy corn was very good. Thayer, Kansas has a couple of steakhouses. 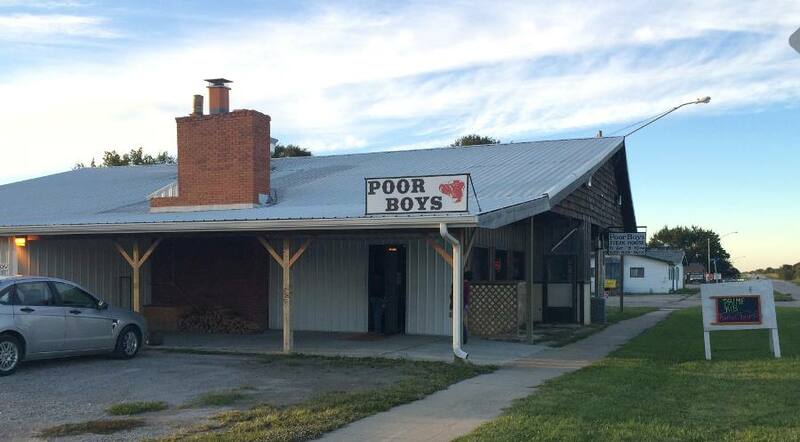 I was disappointed with Big Ed's Steakhouse that last time we ate in Thayer, so this time we tried Poor Boy's Steakhouse. It is typical for places like this in rural Kansas. Very plain, and open only 22 hours a week. The salad bar was uninspired, but fairly high quality. My ribeye was very tender and had a pretty good flavor. Others in our party seemed to mostly enjoy the meal. Saturday - October 4, 2014: The first weekend in October is always Fall Homecoming in Fredonia, Kansas, where both of Linda's parents came from. It is a town of about 2,400 people and has only 2 motels with a total of less than 30 rooms, so we stay in nearby towns. That is for some values of nearby. The communities are far apart and they have few motel choices as well. We stayed at the Knight's Inn in Chanute. The rooms were clean and in good repair. Service is unavailable after 11 PM, but both of our requests which were made during office hours were promptly filled. The continental breakfast was minimal, but we didn't go there for the food. The price was quite reasonable, and that is no longer true at the motels in many small Kansas communities. We spent Saturday in Fredonia. The parade parade began shortly after we arrived. 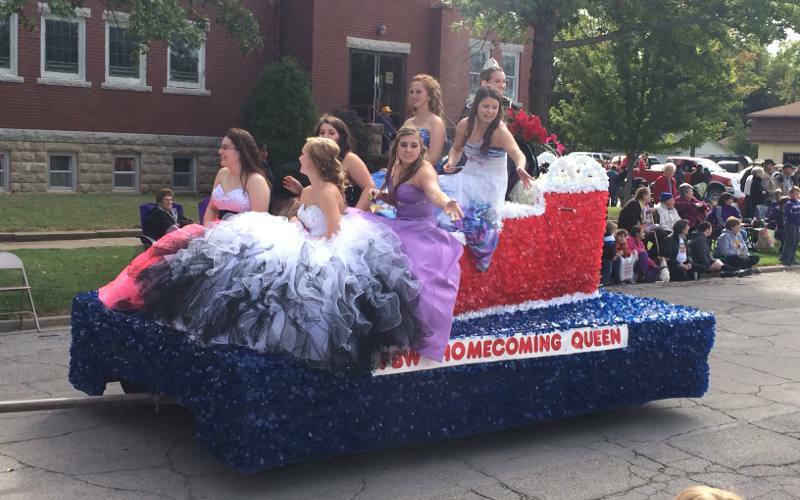 It consisted of several high school bands, a handful of politicians, every EMS vehicle in the county, trailers filled with alumni from the classes which had a multiple of 5 years anniversary, and floats from every church in town. The streets around the courthouse were lined with a carnival, crafts & gift vendors and many food vendors, both commercial and run by local churches or civic organizations. I sampled beef burgers from 2 of the three vendors serving them. My favorite part of the day was playing bingo at booth on the Courthouse Square. 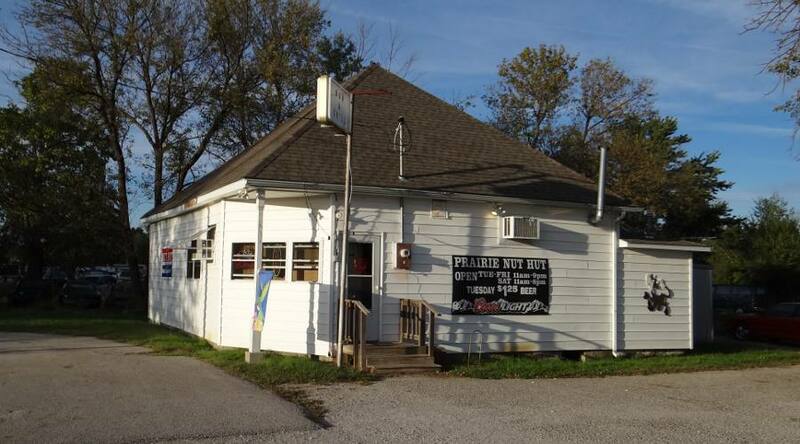 On the way back to Chanute, we had supper at the Prairie Nut Hut (yes those are what they sound like) in Altoona. 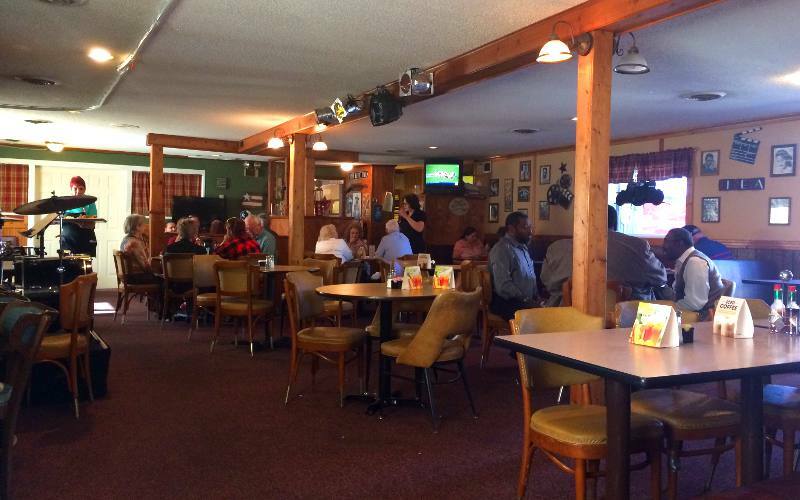 It is a small old bar & grill with a counter and about seven tables. In addition to prairie oysters they serve what I think are some of the best burgers in the state, and fresh made fries and onion rings. Monday - October 6, 2014: Linda joined me in a revisit of Freddy T's Restaurant and Cafe in Olathe. The menu and prices were unchanged since out last visit in January. We had the Swiss Burger, True Bleu Burger, hand cut fries and onion rings. I don't believe that the rings were worth the $1.50 up charge, but everything else was quite good. The fries can be seasoned or unseasoned and I was happy with the unseasoned. Tuesday - October 7, 2014: I learned today that Celebrity's Sidewalk Cafe in Olathe is closed and totally moved out. The 12 year old restaurant was still operating in August. 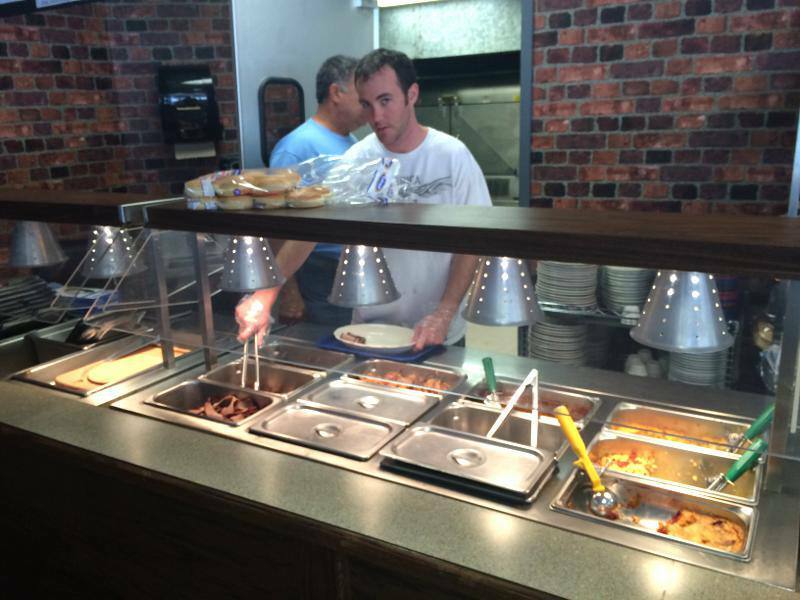 Wednesday - October 8, 2014: Updated the reviews of Freddy T's Restaurant and Cafe and Neewollah (which is Halloween spelled backwards) in Independence, Kansas. Thursday - October 9, 2014: Linda and I had lunch at Santa Fe Cafe in Overland Park. 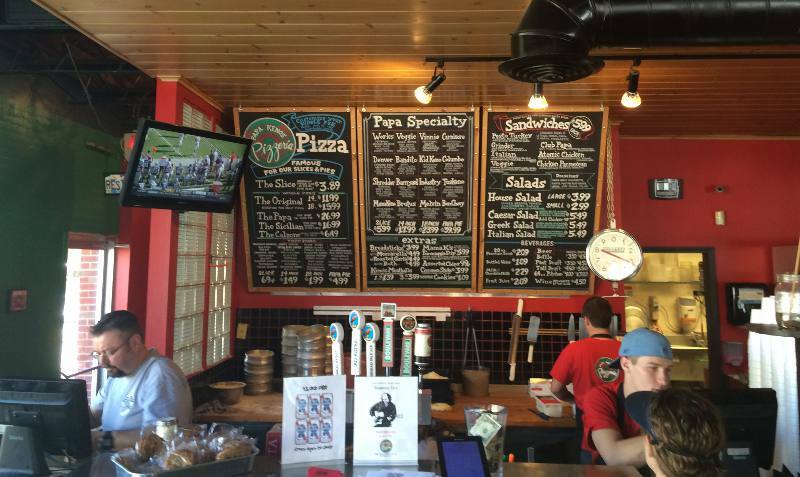 Its listing in the Overland Park Restaurant Guide had not been updated since 2013. I had forgotten how few lunch entries are on the menu. It is almost entirely breakfast or sandwiches. Still, the sandwiches are good. 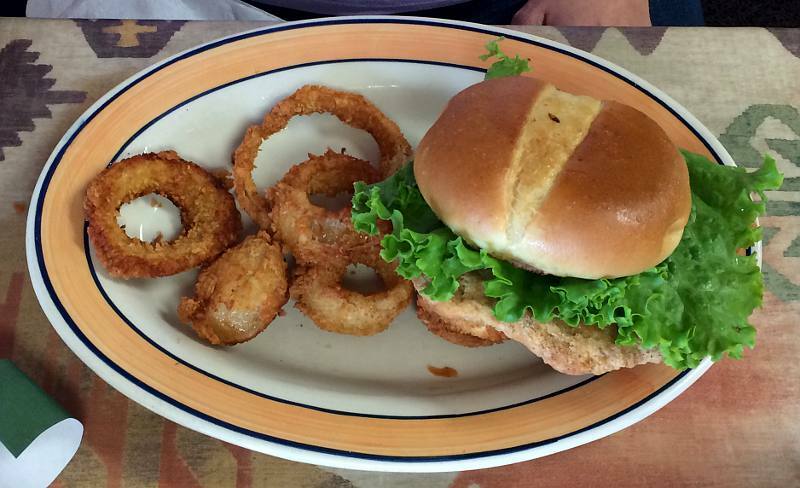 I enjoyed my burger and Linda's pork tenderloin sandwich and onion rings were quite good. Santa Fe Cafe is open from 6 AM to 2 PM daily. From 7 AM on Sunday. 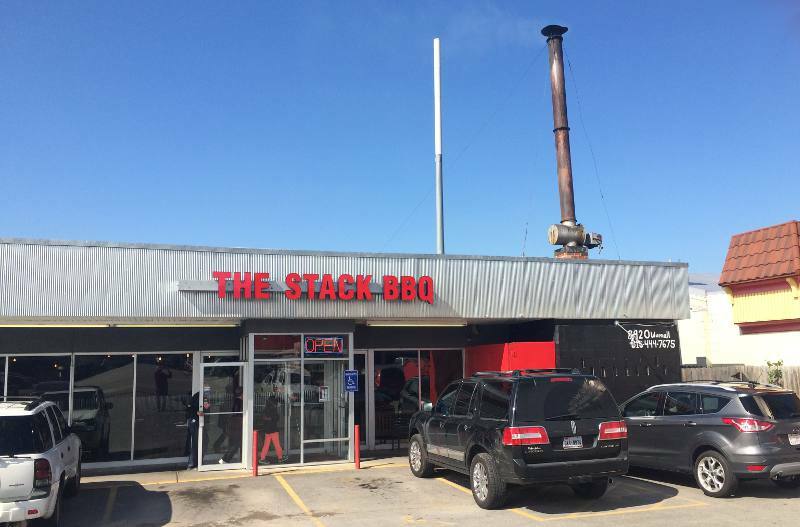 Saturday - October 11, 2014: We had lunch at The Stack BBQ on Wornall Road in Kansas City, Missouri. This storefront barbecue restaurant has a long history. It was founded as the Smokestack by Mary Fiorella McPheron, the daughter of Russell and Flora Fiorella who started the original Smokestack on 71 Highway. Other Smokestack locations are now called Jack Stack Barbecue and operated by Mary's brother, Jack. This location was then run by Mary's children and then by some long term employees. Its reputation went down hill over time and it closed in 2013. Finally, long term customers purchased and remodeled the restaurant and The Stack BBQ open in April of this year. Former employees still work there. The interior is quite plain. The flavoring in the the rubs and sauce at The Stack are similar to that at Jack Stack and the large onion rings are similar, despite a different presentation. The sausage and burnt ends were my favorite meats this day, with the ribs being almost as good. The onion rings, fries, cheesy corn and garlic toast were all good. If this restaurant was located a little closer, this place would move into the rotation of bbq restaurants which we visit. Monday - October 13, 2014: Linda joined me in paying my second visit to the new Fireside BBQ in Overland Park. The food was a little warmer today and I had a chance to try the ribs for the first time. I would say that they are little above average, but my favorite meat is still the rib tips. Science Fiction author and scientist, Dr. David Brin, appeared at Jayhawk Ink Bookstore on the University of Kansas in Lawrence. I was among the 25 or so people who heard his presentation on The Dangerous Impudence of Speculative Fiction and photographed it for our sister web site, the MidAmerican Fan Photo Archive. I attempted to have supper at Little Saigon Cafe in Lawrence, which has been receiving some good reviews, but it turned out that Little Saigon Cafe is closed on Sunday & Monday. 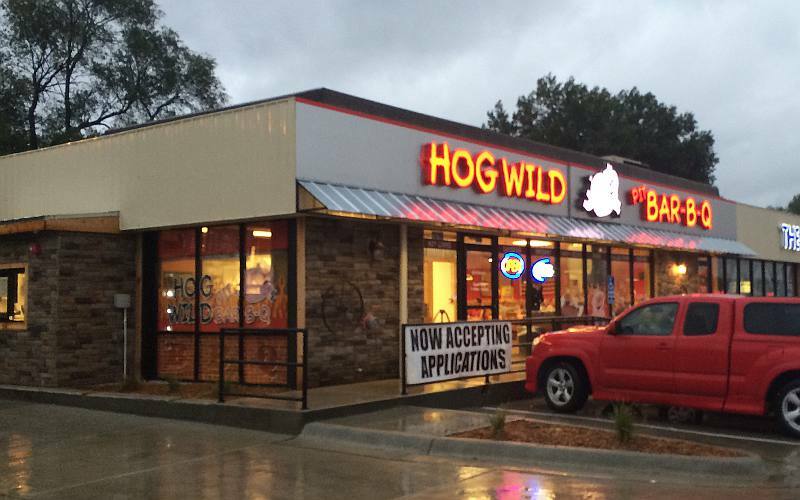 It turned out that a brand new restaurant is located next door - Hog Wild BBQ. Hog Wild is a Wichita based chain and I have previously dined at their Hutchinson location, across the street from the Kansas State Fairground. The hot links tasted pretty good, but I wish they hadn't been saturated in their sauce. Hog Wild has two sauces on the table and there is no reason that diners shouldn't be able to select which sauce and how much sauce they want. The curly fries were fine. The corn tasted like it had just been dumped out of a can and heated. Friday - October 17, 2014: The 28th Annual Lenexa Chili Challenge began this evening in Lenexa's Old Town. Several streets were blocked off and there were booths with nearly 200 teams competing for best chili, salsa and hot wings. 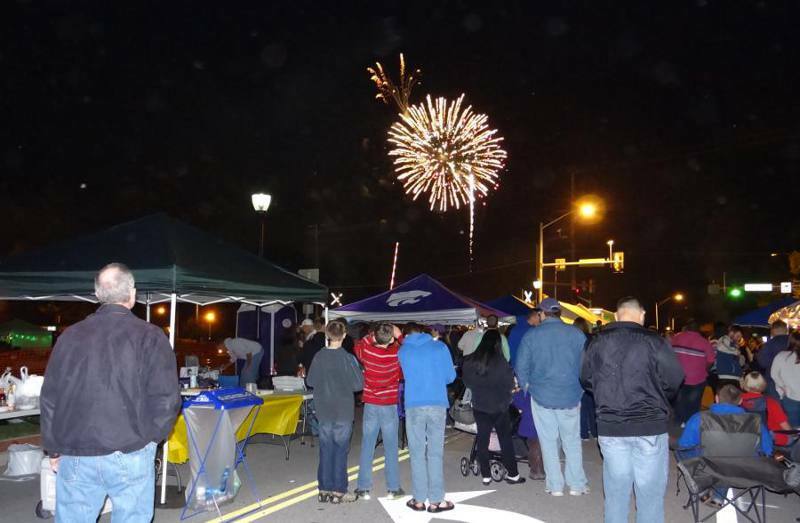 Friday night is mainly a party, with live music on a stage, music at many team's booths and fireworks. For the most part, samples are not given out, but we knew members of some of the teams and were invited to sample some of the good food. I returned Saturday for some daytime photos. On Saturday you are given a plastic spoon as you enter the event space and many of the contestants were offering small samples. With so many teams, it didn't take long to be totally full. There is no charge for attending the Chili Challenge or for samples, though most booths has tip buckets, with the money this year ($4,266.95) going to Juvenile Diabetes. Monday - October 20, 2014: The pages devoted to the Gordon Parks Center in Fort Scott, Grandma Horner's Foods in Alma and the Scandia Museum have been updated. 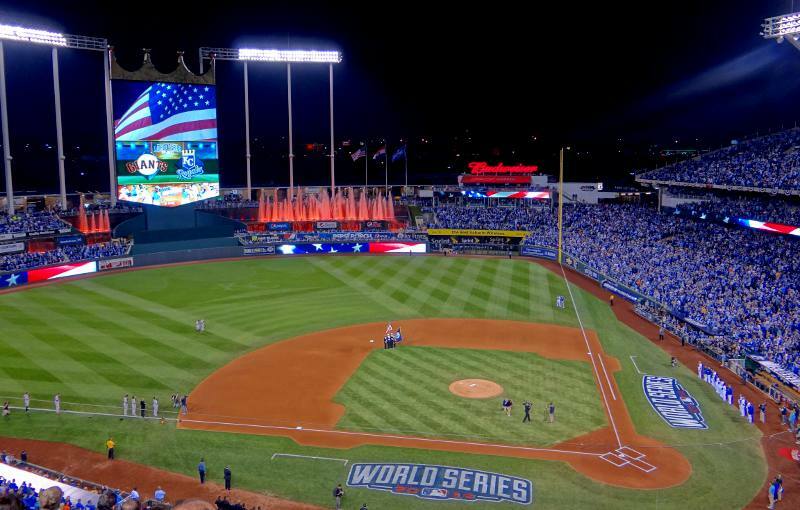 Wednesday - October 22, 2014: Jesi, Linda and I went to game 2 of the World Series tonight. It was beautiful weather for late October, in the low 70s at first pitch and low 60s at the game end. After giving up 7 runs in game 1, the Royals' pitching was much better tonight and the Royals had a big 5 run 6th inning, winning the game 7 - 2. No one left the stadium early and after a brief post game celebration it took a long time to get out of the parking lots and away from the game congestion. Saturday - October 25, 2014: We had lunch at Papa Keno's Pizzeria, to update its listing in the Overland Park Restaurant Guide. It had been several years since the last visit to Papa Keno's and the menu had quite a few changes. The listing devoted to Papa Keno's needs to be totally revised. The $3.89 - $5.99 individual slices of thin crust pizza are about the size of some personal pizzas and is lightly sliced into smaller pieces. The calzones and sandwiches have a higher ratio of dough to fillings than I would choose. Sunday - October 26, 2014: Linda and I had lunch at the Laffon's Frontier Steak House in Kansas City, Kansas. Located less than a mile east of the Legends complex, the Frontier Steak House is like a small town restaurant in the 1970s. Linda had the fried chicken, which is better than some. My 12 ounce ribeye steak was good for its $19.99 price with two sides. 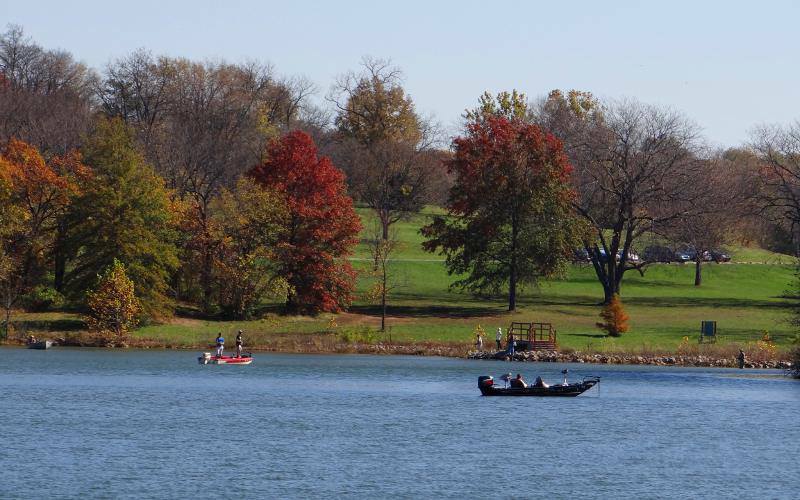 We followed lunch with a drive through Shawnee Mission Park in Lenexa & Shawnee, to add the 4th season to its listing. It was a spectacular autumn day and the Johnson County park was filled with people enjoying the sunny October weather. 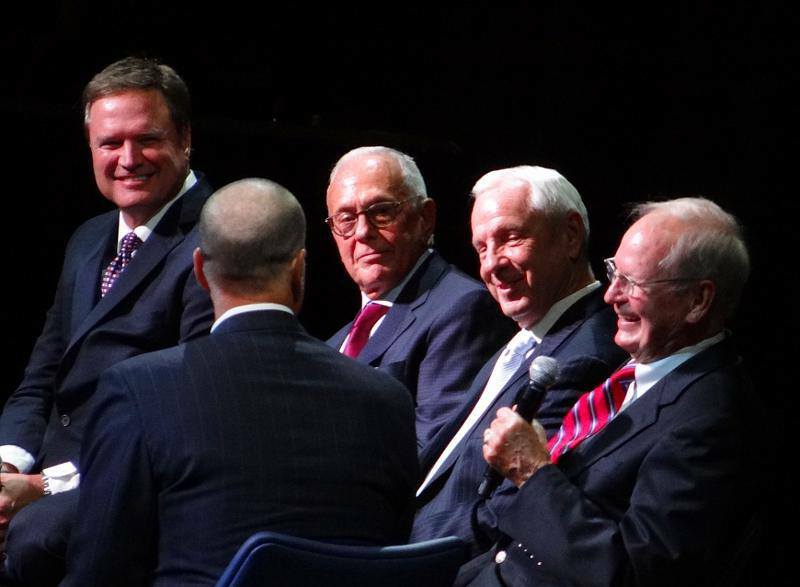 Monday - October 27, 2014: The Allen Fieldhouse 60th Anniversary was celebrated in Lawrence tonight. The program celebrated the history of the University of Kansas sports arena and the four living KU basketball coached were present to share their favorite experiences. In the photo at right, coaches Bill Self, Larry Brown, Roy Williams and Ted Owens are being interviewed by ESPN basketball analyst, Jay Bilas.